John Rigsby, 20, of Malvern. 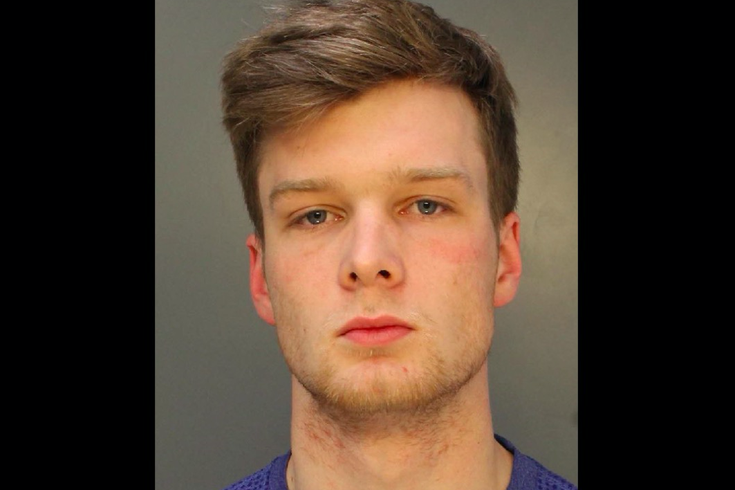 Philadelphia police have arrested a man who allegedly was part of a riotous group of Eagles fans who flipped over a car in Center City after the Super Bowl on Sunday night. John Rigsby, 20, of Malvern, was charged with vandalism and related offenses in the incident along the 1400 block of Walnut Street. Rigsby is the son of Villanova University basketball announcer Whitey Rigsby and was formerly a standout guard on the Archbishop Carroll basketball team. Around 11 p.m. Sunday night, police said approximately seven people crowded around the passenger side of a parked 2017 Nissan Rogue. The vehicle was flipped onto the driver's side, causing dents and scratches. Authorities have not announced charges against anyone else at this time. The owner of the car has received more than $1,100 in donations through a GoFundMe campaign created to help her cover the cost of her repairs. Police are still working to identify vandalism suspects in the aftermath of Sunday night's celebrations. They continue to seek the public's help finding the individuals responsible for looting and trashing a Sunoco gas station in South Philadelphia and two men who allegedly smashed a window of the A.C. Moore store on South Broad Street in Center City.